Queen size bed. Airconditioned, M-Net, Bar fridge, tea/coffee tray, serviced daily, fresh linen and towels. En-suite bathroom with shower or bath. Two single beds/ or when connected a Kingsize bed. Airconditioned, M-Net, bar fridge, tea/coffee tray, serviced daily, fresh linen and towels. En-suite bathroom with shower and room 8 also have a bath. Queen size bed with two single beds. SINGLE BEDS IS PERPECT FOR SMALLER CHILDREN AS THE ROOM IS NOT VERY SPACIOUS. Airconditioned, M-Net, bar fridge, tea/coffee tray, serviced daily, fresh linen and towels. En-suite bathroom with shower. Two single beds and a Kingsize bed. Two adults with two children up to the age of 12. 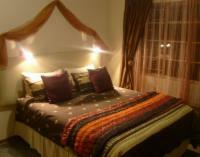 Airconditioned, M-Net, bar fridge, tea/coffee tray, serviced daily, fresh linen and towels. En-suite bathroom with shower. If cancelling 14 days before arrival, forfeit 100% of the booking total. If cancelling 28 days before arrival, forfeit 75% of the deposit. If cancelling 999 days before arrival, forfeit 50% of the deposit. BOOK IN HOURS ONLY BETWEEN 14:00 and 22:00 . NO PETS ALLOWED! !